Sign up for Broadjam today to follow Bobby and Leslie, and be notified when they upload new stuff or update their news! One of the highlights of a visit to beautiful San Carlos, Sonora, Mexico is a chance encounter with a unique musical quartet known to the locals as THE TWINS: four brothers, an uncle, a father, and two sons create a one of a kind sound. Not your father's mariachi band, but more Gypsy Kings! A favorite memory will always be the day we first met The Twins. Leaving one of San Carlos' fine eateries, an impossibly small car pulled up and out popped four guys, two guitars , percussion, and a stand up bass! They played an extraordinary assortment of songs and we sang along in the parking lot for hours. From that point, Bobby and I were hooked. We dare you to try to keep you feet from tapping. In fact, I'll bet you get right up and dance all over the room. A unique talent, Christie Forester's lush piano and keyboard compostions are created in the moment. Hints of familiar melodies are woven to create music that is soothing and fresh. Christie was born in Ambon, Indonesia where her parents, RB and Avelone Caveness were missionaries. At 12, she was her father's church pianist and although musically trained, seized every opportunity to create her own music ... much to her piano teachers' chagrin. After living in Singapore for many years, Christie returned to the United States where she married Walter Forester, completed her Ph.D. and at one time was a professional body builder! Christie lives and creates beautiful music and unique bead jewelry in the seaside village of San Carlos, Sonora, Mexico. for Hurricane Heroes in Mexico! SAN CARLOS, SONORA, MEXICO - More than a dozen of the top singers and musicians of the 1960s music era gathered for an unprecedented event at the Paradiso Hotel Resort, to benefit San Carlos' non profit emergency medical service, RESCATE, and CASA de la CULTURA of Guaymas, Sonora, Mexico. The well known musical stars donated their talents for two Main Stage Concerts, Sunday Dec. 7 and Monday Dec. 8, 2003. On Monday, September 22, 2003, at 7:00pm, San Carlos and Guaymas was hit by the full force of Hurricane Marty causing widespread destruction of homes and businesses. The RESCATE ambulance rescue were heroes many times over. Funds from the Festival in December will replenish the emergency medical supplies seriously depleted during the hurricane..
On Saturday Dec. 6 during the festival , the PERFORMING ARTS COUNCIL of SAN CARLOS hosted "Para Los Ninos." Gifted music students at Casa de la Cultura, a non profit providing free after school music education to the children of Guaymas, enjoyed a Hawaiian Slack Key Guitar master class with featured guitarist Peter Childs (Knob Lick Upper 10,000) and a concert from Chris Montez and Eddie Ponder (Spanky and Our Gang, Flying Burrito Brothers). Students also received donated musical instruments including FIVE new guitars generously provided by Guitar Center of Tucson, Arizona. Opening the festival, Dec 5 was "Songs After Sunset," an old fashioned hoot night! Folks dusted off old guitars to join us on the beach. Bobby Sahlen held down the stage until the bus arrived from the airport with the featured performers. About 70 people stayed to enjoy spontaneous jams with Chris Montez, Ethan Edward and Peter Childs. Hits include "Let's Dance," "Call Me," "The More I See You"
Hits include "Lazy Day'" "Sunday Will Never Be The Same," "Like To Get To Know You"
Hits include "California Dreaming," "Dream A Little Dream of Me," "Monday Monday"
Wrote Hit song "And She's Mine"
"Turn Turn Turn," "Mr. Tambourine Man"
Ethan "George Edwards" Kenning (HP Lovecraft, Manhattan Transfer) "White Ship"
He has happily served as a vocalist, guitar, Bass, keyoard, or Steel Guitar player in genre's from Jazz, Bluegrass, Country, Rock to Gospel. Leslie Sahlen and latin legend Chris Montez, have created "the Mexican Motown" MexMo San Carlos S de RL de CV. Clients include The Twins, The Sahlens, Marc McClure, Eric Holland, Manuelito, Christie Forester, and Janney. Bobby Sahlen is a prolific singer songwriter who has been blessed with wonderful collaborators including Jim Berault, Chris Montez, and Elaine Spanky McFarlane. Gatorlegs/Mexmo has 18 CDs available on CDBaby.com. Leslie Sahlen produced the San Carlos 1960s Music Festival in San Carlos, Sonora, Mexico the Curleyfests in Ferndale and Eureka, California. 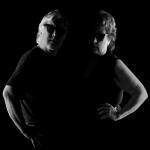 The Sahlens perform live every FRIDAY from 7 to 9 at the beautiful Evie's Upstairs in San Carlos, Sonora, Mexico. What happens when a 70's session singer and a singer-songwriter hook up? Back in 1988, Bobby Sahlen and Leslie Antonetti met through a personal ad in a Dallas weekly newspaper. It was love at first sight. When Bobby heard Leslie sing for the first time during a studio session he was producing, a chain reaction happened that led to many years of musical collaborations, a successful touring group in the nineties, concerts with many surviving members of 60's supergroups in the early part of this new century. Finally, after "retiring" to San Carlos , Sonora, Mexico, Bobby and Leslie Sahlen entered into the ultimate collaboration for two "studio rats". They formed Mex Mo San Carlos, in partnership with 60's superstar, Chris Montez, to promote some of the terrific talent we had found in San Carlos. Besides multiple CD releases of other artists here, Bobby and Leslie recently released their first recorded project in more than 16 years, "Life's Much Better in Mexico.